In this post, we'll see how to generate sequence numbers along with the data that we need in LINQ C#. In general, we can write a stored procedure something like this in SQL and then map this to a DTO or a ViewModel in C# so that we can get the sequence numbers along with the data. But, this isn't any good if we are using Entity Framework. Let's see what we can do to generate the sequence numbers in C#. First, we'll write our query with DB context to fetch the data we want. The above LINQ query just pulls Datacolumn1, Datacolumn2 from TestTable if executed. 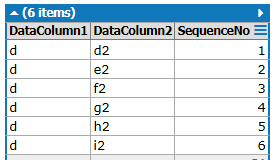 Now, to get another column with sequence number, we'll just enumerate the results of the above LINQ query so that we'll get the columns we want. Luckily, the IEnumerable interface provides an overload of SELECT which can do this. Here is the SELECT overload definition. So, we'll see how it's done. As you can see in Line 01, we've enumerated the results from the LINQ to Entities and then we performed a .Select() on the enumerated set. The index will have a starting value of zero so we'll increment it to make the indexing start from 1. It's up to you. Why didn't we do it on the first LINQ query? The first LINQ query is IQueryable and it doesn't have the overload of .Select() that has an index. So, we have to enumerate the results and then add sequence. So, in order to do it, we've to first make the IQueryable result to and IEnumerable result (as we did this in our second query using .AsEnumerable()).